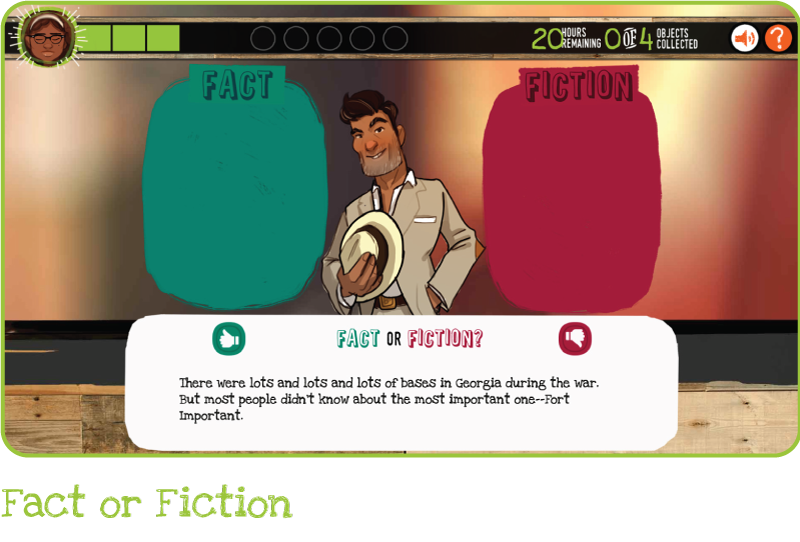 In order to find hidden artifacts, Savannah and Peaches must first figure out where in Georgia they should travel. 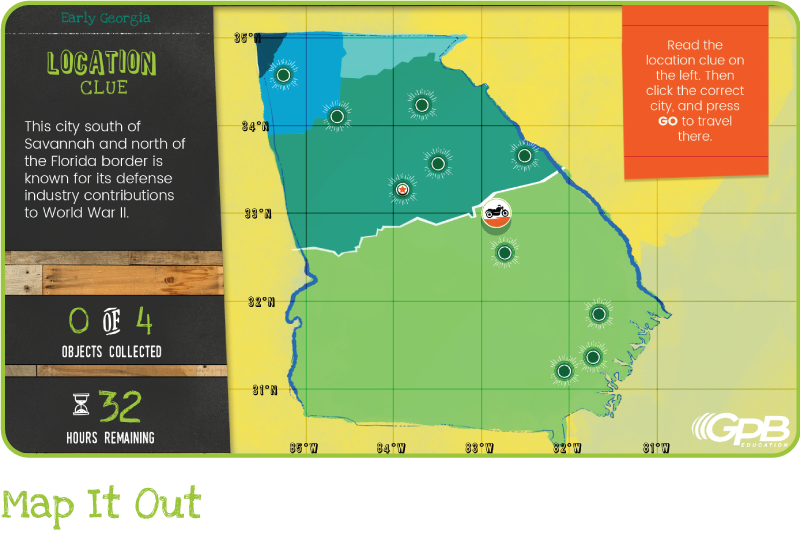 You can help them by selecting a city using clues about Georgia’s regions, physical features, longitude and latitude, and other geographic information. Be careful … travelling to the wrong city can waste precious time as you race against your foes! 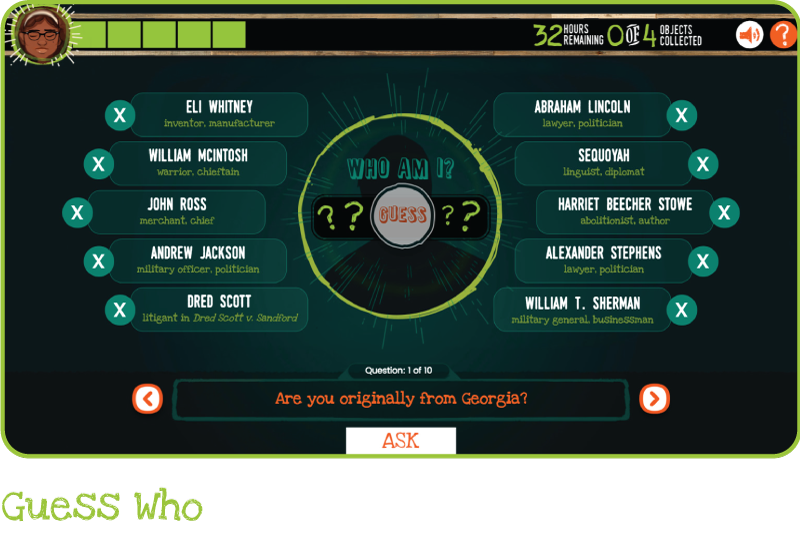 Help Savannah and Peaches guess the identities of historical figures by asking questions. You only get five questions before you have to make your final guess! As you go, you can tap on the names to 'cross them off your list.' When you think you have the right answer, simply click the big “Guess” button in the middle of the screen to see if you are right. To win this challenge and the associated artifact, you must help Savannah and Peaches restore the broken links of time. 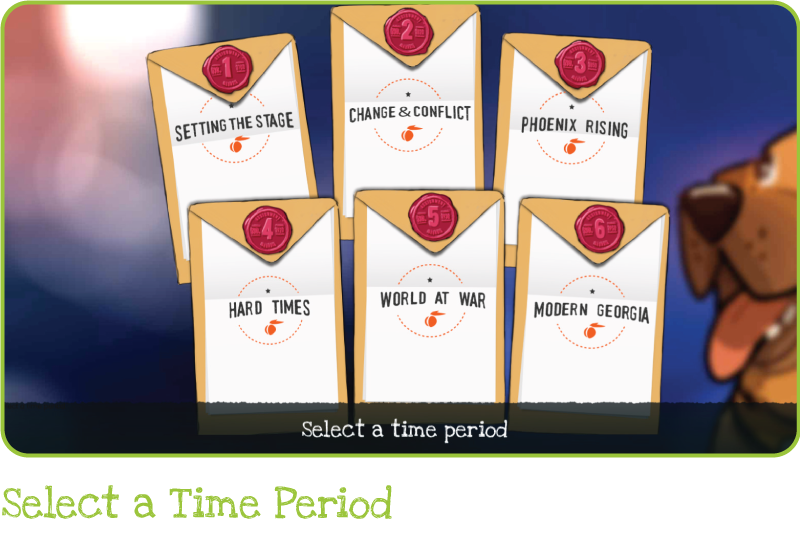 Put five historical events in order of cause and effect, from left to right. 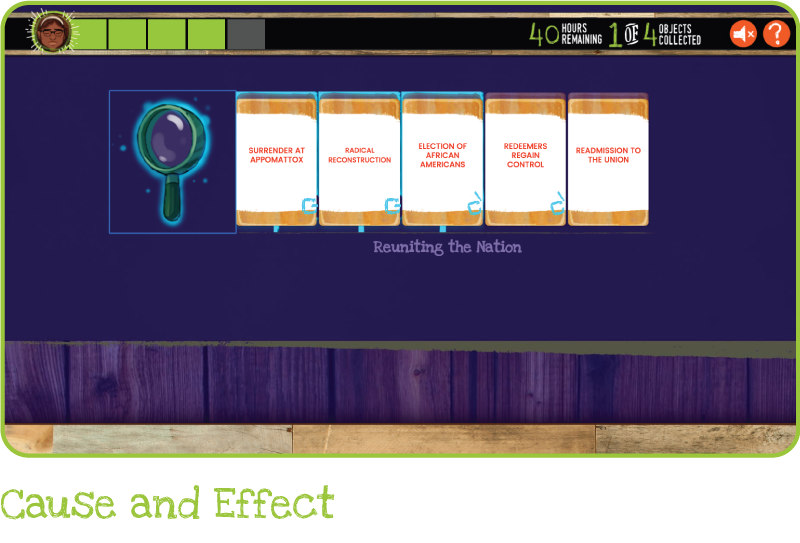 You may click the cards to flip them and learn more about each event. Make sure you get everything in the correct order before you run out of tries! Savannah and Peaches encounter a mixed-up art collection with images and facts from Georgia history. 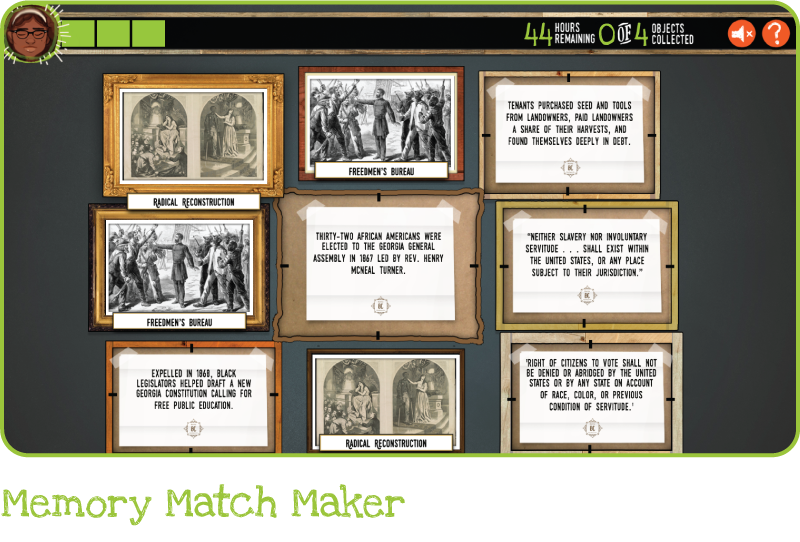 Help them match two framed facts about the same person, place, event, or artifact to reveal the corresponding hidden images. Find all the matches before you run out of tries. Be careful … one of the cards doesn’t have a match! Musty Bureaux is trying to trick Savannah and Peaches with some shady clues, but you can help them decide whether each one is fact or fiction. You are given a series of statements and must pick thumbs up (fact) or thumbs down (fiction). If you get five right without running out of tries, Honey, the museum director’s assistant (who happens to be a sugar glider), will open the chest and reveal the artifact. After you win a challenge and receive an artifact, help Savannah and Peaches place the artifact in the correct spot on the timeline. You can tap the artifact to read more about it.